Diversification is the key to long-term investment success because it can insulate you, to some extent, from losses. If you feel insulated, you are more likely to stay invested and keep investing through market volatility. Being properly diversified also enables the actions that help you during market corrections: rebalancing and tax-loss harvesting. Investors often think they have a diversified portfolio when, actually, they don’t. One of the common questions we get from investors who don’t use Wealthfront is: “Why shouldn’t I just invest in the S&P 500®?” They seem to believe investing in an index that gives them exposure to a broad selection of securities means they have a diversified portfolio. Having a broad selection of securities is a good start. But it’s only one of the three dimensions of diversification. In The Elements of Investing, Burton Malkiel (our Chief Investment Officer) and Charley Ellis, noted investor, author and member of our investment advisory board, outline three dimensions of diversification to improve your chances of long-term investing success. Diversifying across assets means investing in the stocks or bonds of many companies and issuers, not just a few. Doubling down on your company stock is a glaring example of not diversifying across assets. Even if you work for Apple, Google or Facebook, owning too much of your own company stock has the potential to create serious financial problems. In their book, Burt and Charley describe an Enron employee who invested her entire retirement savings in Enron stock through the company’s 401(k) plan, only to see her savings decimated when Enron unraveled. This is an extreme example. The general point is that individual stock ownership represents diversifiable risk (in contrast to market or systematic risk). Diversifiable risk, by definition, is risk that can be mitigated by spreading your portfolio across a broad set of investments. In general, diversifiable risk is not expected to be rewarded by market valuation. To be diversified across assets, don’t invest a lot of your portfolio in any single stock, and don’t allow your company stock to dominate your portfolio after it has become vested and liquid. Instead invest your money in broadly diversified index funds. For your US equity exposure, we recommend you invest in broadly diversified, low-cost ETFs like VTI, which gives you exposure to over 3,000 US stocks (including Apple, Google and Facebook!) for the measly cost of 0.05% annually (e.g. $5 annually for every $10,000 you invest). A portfolio diversified across assets will also tend to give you higher returns. The S&P 500 does not include over 2,500 smaller companies that are included in VTI that also trade publicly in the United States. In years where those stocks outperform their larger cousins, the S&P 500 underperforms the broader US market. Another important way to diversify is across the capital markets — by capital markets I mean different types of stocks and bonds, or asset classes. You can improve your risk-adjusted returns by investing in less correlated assets, because it is virtually impossible to predict in advance which asset class is going to outperform the others in any given year. To illustrate the point, scroll down and examine the interactive table below, it displays the ranking of asset class returns by year for the past 10 years. The key takeaway is each year’s winner is different. • Three asset classes have outperformed US Stocks in 2014: Real Estate, Dividend Stocks and Emerging Market Bonds. • US Stocks have been the top performing asset class only once in the past 10 years (in 2013). A portfolio diversified across asset classes will also tend to give you higher returns. It’s easy to see why. If you invested only in an S&P 500 index fund, you would miss out on the winning years of the other asset classes. There is one more dimension of diversification: time. In an ideal world, you would invest a large sum as early as possible. Unfortunately, this isn’t consistent with how most people earn (i.e. salary, vested company stock, bonuses) and you may need to work through some decisions before investing a large sum anyway (e.g. buying a home or paying off student loans). Moreover, investing all at once can make you more sensitive to the timing of your investments if the markets correct soon thereafter. Unfortunately, too many investors suffer from decision paralysis: they are so afraid of picking the wrong day to invest, they end up not investing their savings in the markets, missing out on valuable time in the market to compound their savings. Dollar-cost averaging is the most popular way to diversify across time and avoid this issue. Rather than pick the “right day” to invest, dollar cost averaging is a process where investors break up a lump sum into several amounts, and then invest a portion consistently over time. For example, an investor with a $20,000 bonus might invest $4,000 per month for 5 months. All data in the table above for 2014 is through Dec 31, 2014. 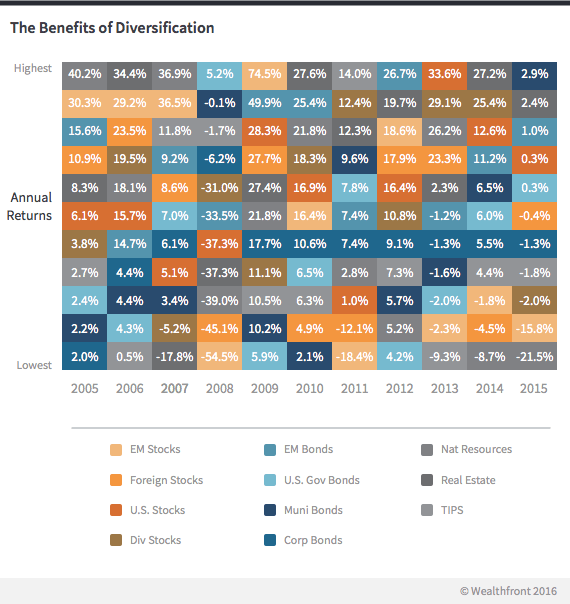 If you diversify across the three dimensions recommended in this post, you can increase your risk-adjusted returns over the long term. And in a volatile market, you will sleep better at night knowing that you have protected your portfolio across all three dimensions. This post is an update of an original post by Jeff Rosenberger that appeared on this blog in July 2013. Nothing in this article should be construed as a solicitation or offer, or recommendation, to buy or sell any security. Financial advisory services are only provided to investors who become Wealthfront clients. Prospective investors should confer with their personal tax advisors regarding the tax consequences based on their particular circumstances. Wealthfront assumes no responsibility for the tax consequences to any investor of any transaction. Past performance is no guarantee of future results.The S&P 500 (“Index”) is a product of S&P Dow Jones Indices LLC and/or its affiliates and has been licensed for use by Wealthfront. Copyright © 2015 by S&P Dow Jones Indices LLC, a subsidiary of the McGraw-Hill Companies, Inc., and/or its affiliates. An rights reserved. Redistribution, reproduction and/or photocopying in whole or in part are prohibited Index Data Services Attachment without written permission of S&P Dow Jones Indices LLC. For more information on any of S&P Dow Jones Indices LLC’s indices please visit www.spdji.com. S&P® is a registered trademark of Standard & Poor’s Financial Services LLC and Dow Jones® is a registered trademark of Dow Jones Trademark Holdings LLC. Neither S&P Dow Jones Indices LLC, Dow Jones Trademark Holdings LLC, their affiliates nor their third party licensors make any representation or warranty, express or implied, as to the ability of any index to accurately represent the asset class or market sector that it purports to represent and neither S&P Dow Jones Indices LLC, Dow Jones Trademark Holdings LLC, their affiliates nor their third party licensors shall have any liability for any errors, omissions, or interruptions of any index or the data included therein.